So moist and full of banana flavor, you will not be able to get enough of this banana cake! If you have any over ripe bananas laying around the house, this is the perfect time to use them. The more ripe the banana, the better this cake will turn out! 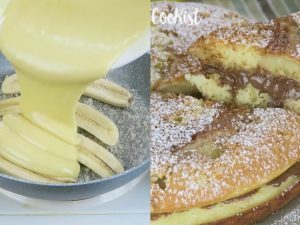 Whole bananas are mashed into this batter and then baked to perfection. 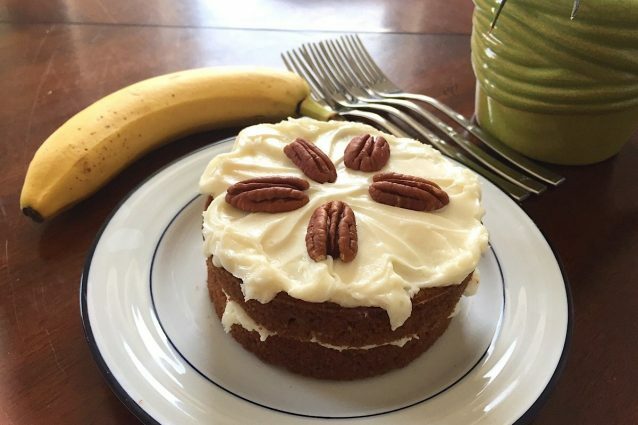 Not too dense but definitely not light, this banana cake recipe makes a cake that can hold up next to almost any frosting. Make it for a special occasion or just to have around the house- it will definitely be gobbled up! In a stand mixer with a paddle attachment, cream the butter, brown sugar and white sugar together until light and fluffy. Scrape down the bowl as needed. Add the vanilla extract and the eggs to the mixer slowly, adding one egg at a time and scraping down the bowl after each addition. Add the mashed bananas to the batter and briefly mix together. Add the flour, baking soda, salt and cinnamon to the batter and mix until a smooth batter forms, scrap down the bowl as needed. While the mixer is running on low speed, slowly add about half of the milk. Stop the mixer to scrape down the sides of the bowl then turn it back on and continue to add the remaining milk. Pour the batter into two greased eight inch cake pans. Bake in a 350 ̊F oven for about 50-60 minutes or until a knife inserted into the center of the cakes comes out clean. Once the cakes have cooled, ice as desired and enjoy! -This cake pairs wonderfully with a cream cheese frosting. You can also try a peanut buttercream or chocolate buttercream frosting to make this cake even more rich. -If you have over ripe bananas at home but aren't quite ready to bake, peel the bananas and freeze them in a sealed plastic bag. When you are ready to use them, take them out of the freezer and let them thaw at room temperature and then use as directed! No-oven banana cake: make a delicious dessert in just minutes by using a pan!